The second level of the Open System Interconnection (OSI) model is the data link layer. The data link layer is adjacent to the physical layer, so they are associated pretty closely together. Whereas the physical layer deals with the actual physical media (the cables and so forth that the data move over), the data link layer deals with signaling or the method used to send data across that media. Part of sending signals across the network’s media is coming up with a way to identify the sending and receiving devices. To solve this issue, networks use numeric identifiers such as a MAC address associated with a network interface card (NIC). 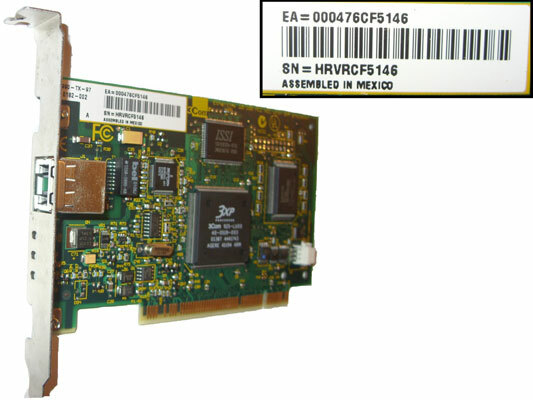 Every network card manufactured in the world has a globally unique MAC address associated with the card. To make identifying the MAC address easier for the end user, it is usually printed on the outside of the product box, written on the card as shown in the following figure (where 3Com decided to identify it as the EA number), or on the outside of the computer that it is installed in. If you have a laptop, turn it over and there is a good chance that you will see the MAC address. When looking for your MAC address, it will always be a 12-digit hexadecimal number, which was clearly identifiable from the serial number (SN) which includes non-hexadecimal characters. The type of addressing or options that would be used at this layer depends to a degree on what physical layer is being used, so data link addresses for serial connections are different than Ethernet connections. Although in all cases, this includes some type of addressing that is compatible with the physical layer so that devices connected to that layer can identify themselves and other devices connected to the media. This is important, because when a computer sends data to a network file server, you would like that data to get to the server. The key thing to remember about the data link layer is that it contains those devices that communicate with the physical layer and a method of identifying physical parts of the network.